Travel Exclusive: Jet-lagged? Give eyes a wake-up call anytime, anywhere with this duo of instant refreshers. Cooling rollerball applicator helps massage away bags, brightens and refreshes on contact. Makes All About Eyes Serum De-Puffing Eye Massage the perfect travel companion—especially when you’re tired of hearing "you look tired." Lightweight, oil-free, non-irritating formula layers beautifully under or over other eye treatments, makeup. One for home, one for travel. Ophthalmologist tested, of course. Allergy Tested. 100% Fragrance Free. 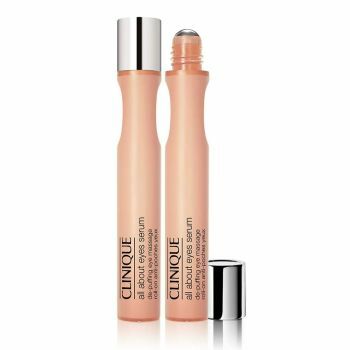 This Duo contains of: 2 x All About Eyes Serum De-Puffing Eye Massage 15ml (Limited Edition - Travel Retail Exclusive).